While I am always aware at this season how much I have to be thankful for, this year is a little bittersweet as it’s the first Thanksgiving I don’t have all my family home for the holiday. Anticipating this, I thought it would be a good opportunity to try a slightly different venue. With the smaller group, I decided to move Thanksgiving to the kitchen table with a slightly more contemporary feel. 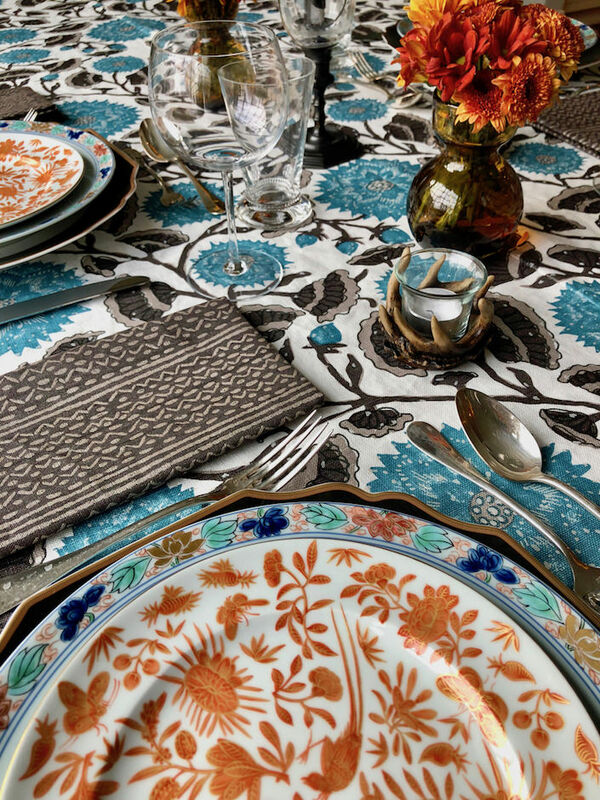 While there are many ready made table linens on the market, I think people sometimes forget other options for creating a bespoke table setting that is different and unique. 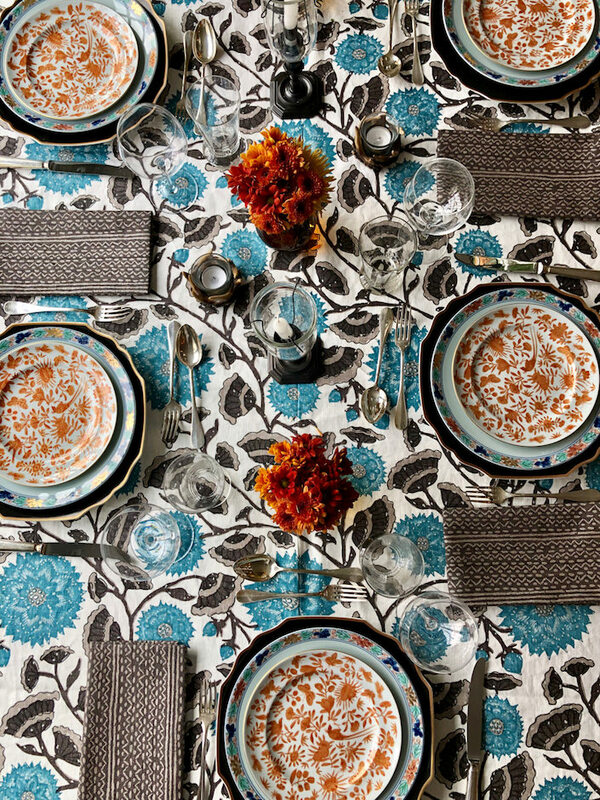 This Thanksgiving I used a pair of Peter Fasano‘s newly recolored patterns for a bolder take on a classic scheme. 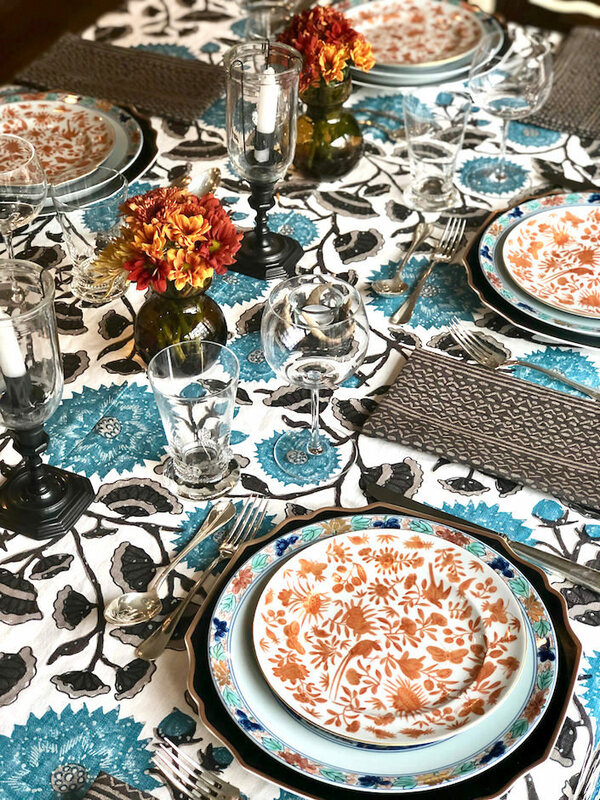 Just as they have reimagined their archival collections, I reimagined my tabletop collection using their fresh reinterpretation of their Jaipur floral and graphic Angelina for napkins in a modern charcoal colorway. Looking back to move forward is always the best way to create something meaningful and new! Wishing all of you a wonderful Thanksgiving celebration with family and friends! This entry posted in holiday, interior design. Entry Tags: Peter Fasano, table setting, Tabletop, Thanksgiving Bookmark the permalink. Love those Chinese Export plates. Happy Thanksgiving to all of you. Such a beautiful tablescape, thank you so much for sharing it with us. Happy Thanksgiving! I love what you have done to shake up the traditional Thanksgiving look! p.s. Happy Holidays to All.